The past few weeks I've had the pleasure of testing the Tyan Tempest S32272NR-C950 motherboard with Atom C3950 "Denverton" processor. Yes, it's been a real pleasure as it's been a few years since last touching an Atom system and this current combination allows for a mighty competent configuration with the C3950 server processor featuring 16 physical cores (no HT) running at a 1.7GHz base frequency and 2.2GHz turbo frequency all while having a 24 Watt TDP. Can the heatsink be changed to something more appropriate, or is that a proprietary format? Too bad the CPU lacks AVX. I guess it would have become a too strong competitor for Xeons. Thanks for the review of this new platform. Is there a chance you could get one of the newer Atom models that includes QuickAssist support for some SSL testing? This model lacks that support, and it's pretty useful when using these parts in web-server setups since SSL is pretty much a requirement these days. Seems proprietary. The second image here https://www.servethehome.com/tyan-te...ard-announced/ is real-life size (click on the image, then check USB and Sata port size), and the holes make a rectangle, not a square. Given what it is, it's easy to mod an aluminum lower-profile cooler to replace that, so you can fit in short mini-itx cases. Or you can just place a 100mm or 120mm fan on top of that thing. 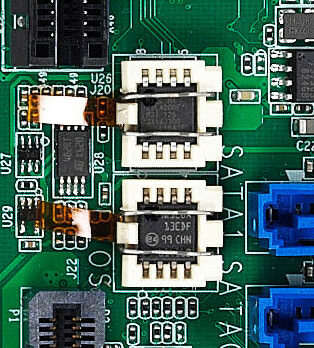 For a motherboard classified as a server board, isn't 2 SATA ports too few? Nope. A "server" is just a device providing some service over the network. Only storage servers and large database servers actually need more than a RAID1, and if the server is part of a large deployment of small units doing the exact same job, or a cluster, you can even go with a single disk (as a failure of a single unit won't affect the overall operational status of the group). Like for example a webserver, or the backend for a web application (that does not require a large database), or a VPN server. To be classified as "server" board it must be designed to work 24/7, have 2 or more ethernet ports, and not look "gaming". It's very common to have ECC and VT-x/d too, but not a strict requirement. Apart from that anything is OK, as server roles are as diverse as the applications they run to be "serving" something to network clients. I'm pretty certain Goldmont architectures are in order pipelines, so it's immune to the recent spectre and meltdown vulnerabilities. It'll never do well on lightly or single threaded workloads, and that's almost all of them, but it might do well on process parallel workloads like compile farms though. This board is perfect for generic serving in white box datacenters. Low TDP, lots of cores and throughput. Don't need AVX. Missing an L3, but you can get a Xeon-D if you need it that bad. MSRP for the CPU is showing at $389 according to cpu-world. C3000 is Denverton, not Goldmont. Denverton does out-of-order, at least the FPU.